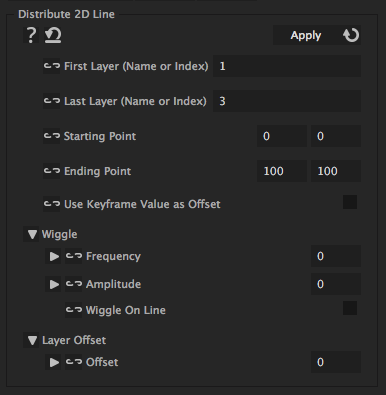 With this iExpression you can place layers in a straight line. For horizontal or vertical lines, you can also use the 'Align Layers in Row' or 'Align Layers in Column' iExpressions, if you don't need the advanced parameters like the wiggle. adds the keyframed value to the position on the line. Hence, all layers except the first and the last one are then only placed exactly on the line when their keyframed position is (0,0). Other values cause a corresponding offset and allow to animate the position relative to its placement on the line.